“a Lamp to my feet. a Light for my path.” – Jeremiah 33:3 | A LAMP TO MY FEET. A LIGHT FOR MY PATH. is often referred to as God’s telephone number! and promises that He will answer. …and listen to what He has to say. and that only He knows what is truly good for us. …and He will shine a light in our heart. 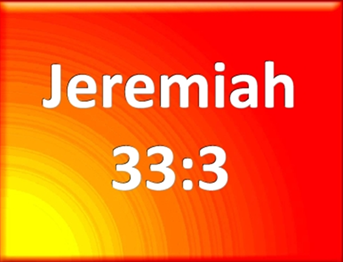 Let us call “Jeremiah 333” every day! My Lord and my God, how generous You are! and for being there, every time, to answer my call. Speak to me, Lord, I am listening.